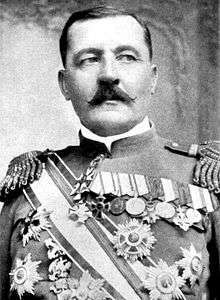 Janko Vukotić (18 February 1866 – 4 February 1927) was a Serdar, general in the armies of the Principality and Kingdom of Montenegro in the Balkan Wars and World War I.
Vukotić was born in Čevo, belonging to the Vukotić brotherhood; he was related to Petar and Milena Vukotić. He studied at the lower gymnasium at Cetinje, and at the Military Academy in Modena in Italy. Vukotić served as Montenegro's Defence Minister in the periods of 1905-1907, 1911–1912 and 1913–1915, and as the Prime Minister of Montenegro in 1913-1915. Vukotić commanded the Montenegrin Eastern Army during the First Balkan War and the Montenegrin division of the First Serbian Army during the Second Balkan War, in which he distinguished himself at the Battle of Bregalnica. During the First World War, Vukotić was the Chief of Staff of the Montenegrin Army and the Commander of the Sandžak Army of Montenegrin forces. He is most famous for winning the Battle of Mojkovac, in which his daughter, the only female participant, Vasilija Vukotić was a courier. He was taken prisoner after the surrender of Montenegro in January 1916, and spent the rest of the war as a prisoner in Hungary. After the war, Vukotić served as a general in the Yugoslav army until his death in 1927. He was buried in Belgrade's New Cemetery. 1 2 Martinović 1957, p. 5. ↑ Јавно комунално предузеће "Погребне услуге". "Јанко Вукотић". Сахрањен је на Новом гробљу, Аркаде, гробница 8, реда I.
Martinović, Niko S. (1957). Janko Vukotić i kapitulacije Crne Gore 1916 godine.